I have been asked by friends and visitors to FCW to explain where I think we are on the issue of predation. 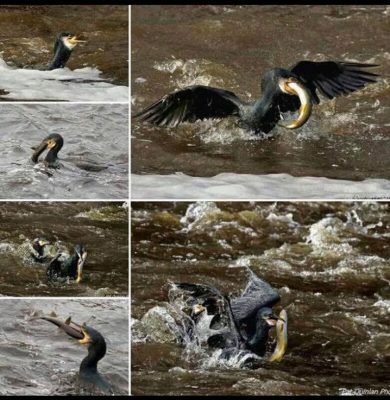 Whether you are in a boat on the Tay, or on the banks of the South Esk, you only have to observe for a short while before you have evidence of predation before your very eyes. Most often in fresh water it will be fish-eating birds, but you might also see mink, otters, or the occasional seal, all of which will most probably be feasting on salmon and sea trout parr, and, in the spring, on their smolts, as they migrate towards the sea. You might then logically say to your angler friend, “terrible, isn’t it, that we allow this to go on. We should be culling these predators to conserve our salmon stocks”. So there you have it. We think we already know which species of UK’s indigenous animals are killing our salmon. And these predators are being supplemented by new ‘invasive’ arrivals as sea temperatures rise. Should we put a stop to this constant attrition by trying to exterminate more of them than we do at present? If we were successful, our salmon and sea trout could migrate with less prospect of being eaten. Is that the way forward? I know that most people will say, “what a stupid question! Of course I don’t want to kill them all. I want to see a balance in the way we manage our wildlife”. Good, that is a really sensible answer, as any grouse moor manager and GWCT will tell you; but how do we decide what that “balance” should be? One person’s balance (the salmon angler) is another person’s slaughter of innocent wildlife (the RSPB). So, who is to decide the proportions of predators and prey that make for that balanced management approach? For some people it is reasonable to assume that people who want to conserve stocks of wild salmon and sea trout want to see a reduction of predation. But we would also like to see wildlife beside and in our rivers – herons, mergansers and perhaps the occasional cormorant, a family of otters, along with other species such as dippers and kingfishers that pose even a minimal threat to stocks. After all, all these animals are part of our national wildlife; they belong here just as much as salmon and sea trout do. I guess we anglers are looking for a sort of utopian balance, with free rising salmon rising in every pool, but without the burden of conscience from having to organise multi-species genocide to get it. IS THE PREDATION PROBLEM REALLY ABOUT POLITICS? The same sort of thing applies to RSPB and protection of piscivorous birds, along with birds of prey, and with little thought of that elusive balance. Wise management, not just simplistic species protection, is required if we are to get the balance right, and thereby start to rebuild salmon and sea trout stocks. At present decisions on how many are killed are made a long way from the riverbank. The truth is that the various species-protection organisations are not concerned with management. Their interest is protection of their target species. Balance between the biological/environmental, economic, social and cultural aspects of human interactions with different species comes later, sometimes not at all. If ‘balance’ comes into their campaigns it is politically motivated as a sop to the public, or to support specific habitat requirements. WHAT CAN WE DO ABOUT PREDATION? Our resources are limited. Our communities are often divided in their views, and no one really knows where to start. One refrain from decision makers keeps returning, “Get your facts in order. Provide evidence. Wheel out the scientific data”. That means scientists. They are the people who can access the Facts, and politicians will only act on scientific facts. Science is important: in fact, you can’t move without it! BEATING OUR HEADS AGAINST BRICK WALLS! But what happens when we present the facts, as AST did conclusively with impacts of sea lice on west coast Scottish sea trout stocks, and still they won’t listen? In the following paragraphs I will start to set out the research and actions currently being undertaken to assess the threats to salmon and sea trout survival posed by predators. This is work in progress because it takes place in a rapidly changing natural environment with climate change and over exploitation of the seas, to name but two issues. There is no doubt that predation in its various forms takes a heavy toll of wild Atlantic salmon and sea trout at all stages of their life cycles. I have already highlighted the concept of ‘balancing’ different aspects of human interaction with these two species of fish, other wild life species, and the habitats that support them. I mentioned the importance of resolving the conflict that often occurs between the biological & environmental, social, economic and cultural aspects of that interaction. I also highlighted the obsessive demands of species-specific conservationists, who protect their target species, as opposed to managing them in an ecosystem context. Resolving issues of predation of salmon and sea trout requires a ‘big picture’ risk assessment. If we objectively assess threats to their survival throughout the lives of both species in all their habitats, we can make a list based on the level of damage done to stocks. That list should be as comprehensive as possible, as we try to record every conceivable threat. Human exploitation has to be included if the list is to provide the basis for a solution, including direct and indirect human activities. Having done that, we should apply an ‘efficacy matrix’ to each of the threats, starting with the most serious, then using the matrix as a filter to assess each threat in order to reach a point where priorities for action start to emerge. We already know about some obstructions to fish passage where, for example, energy infrastructure projects in river catchments and coastal waters severely restrict migrations. We are also starting to understand the wider damage to the abundance of both species caused by impacts from salmon farming in both fresh and salt water. Those of us who live near a river, estuary or foreshore also observe in-river and coastal ‘natural’ predation, but I think it is fair to say that we are often unsure of where in our list these threats fit. For me the purpose of ‘the efficacy matrix’ is to assess each threat in terms of the likelihood of success in resolving it. After all, there is absolutely no chance of a useful outcome if all we do is to rant and rave about particular forms of predation. We must be smarter than that. We should take into consideration such factors as the legal context, the likely cost of any remedial measure, the length of time involved, and possible political support, or opposition. In the background we have the reassuring force of logic provided by the four ‘pillars’ of a healthy, managed rural sector, comprising the environment & wildlife, the economy, social wellbeing, and the cultural context. It is amazing how those four foundations of a balanced rural sector are neglected or put aside for political expedience. In Iceland for example, you don’t find such neglect of our duty as custodians of our rivers and their salmon stocks. Some forms of predation should be high up on our list of threats. Most ghillies and others who work in the freshwater environment observe rogue seals or flocks of mergansers killing both juvenile and adult salmon. Understandably they demand action to stop that happening on the basis of what they have seen. Culling is severely restricted by law because seals and mergansers are protected species. Using my ‘efficacy matrix’ I therefore find myself placing seal and merganser culls lower down the list of priorities for action on the grounds that it will be difficult, time consuming and expensive to change the law to allow meaningful culls of either species. In the absence of a lethal solution we must therefore start looking for other ways of dealing with the problem, if the data show that impacts on salmon stocks are significant. The use of fertility-reducing prophylactics is a possibility, while seal scarers and ‘smolt shepherding’ have been tested by Martin Stansfeld’s team on the North Esk, and could be usefully extended to other rivers. There is however little or no evidence to show that such protection has a direct effect on numbers of returning adults. We badly need such data. In the whole life of the wild Atlantic salmon there are probably three periods when the fish is most vulnerable – parr dispersal in the river catchment, smolt migration from fresh to salt water and coastal threats to returning adults. In general, it is true to say that the smaller the salmon, the more vulnerable it is. On the other hand, we could argue that the nearer a maturing adult reaches its home river, the more precious a resource it becomes, which is why mixed stocks coastal netting is so damaging. The first of these three danger periods is in the freshwater stage, when the fry becomes a parr and disperses within the river catchment. Forms of predation on salmon parr are numerous and difficult to manage because they include widely spread resident trout and piscivorous birds (including mergansers and herons). Fortunately, the salmon parr’s defence lies in its territorial nature, which keeps them reasonably well spread out. The freshwater stage of the salmon’s life cycle is density dependent, which makes it likely that other groups or generations will fill any niches left vacant as a result of predation. Density dependence defines the carrying capacity of a river catchment in its ability to support a maximum biomass of salmonids. It is generally true that Scottish rivers are doing reasonably well as far as recruitment of parr is concerned, but of course there are exceptions. The second vulnerable stage for salmon is during the smolt migration into the lower river, the transition to salt water and the early days of the post smolt in not-very-friendly coastal waters. From the time of smolting to the returning adult we are counting fish that use the marine environment on a density independent basis. If we assume therefore that the moment when the parr ‘silvers up’ to become a smolt represents 100% of the catchment output, then everything that follows is a reduction from that percentage. As such, smolts are irreplaceable. The average number of adults in the return migration throughout the North Atlantic rivers demonstrates that less than 10% of smolts survive to adulthood, or 90% + die at sea. In other words, each smolt that dies is a net loss to the river’s stock. In that context a 2% or 3% improvement in smolt survival could lead to visibly increased numbers of returning adult ‘survivors’. • Where are post smolts dying in the greatest numbers? • What are the main causes of death? • What remedial options are available? • How can we evaluate success of our remedial actions? As post-smolts move out from the coast into their main migration routes, defined by ocean currents and surface conditions, they sometimes get blown off course or accidentally caught up in the huge purse-seine nets of pelagic trawlers. We know that both these things happen, but we don’t know how much damage is done relative to other threats to migrations. Research has already started looking at the by-catch issue by posing the questions, “Where does salmon post smolt by-catch occur?” and “what is the extent of accidental by-catch at specific times of year in those areas?” By observing on-deck procedures, and analysing the catches on pelagic vessels from identified areas of sea we should be able to get a handhold on the seriousness of the by-catch threat. Availability of food is an issue for young salmon in the Norwegian Sea, where prey species have been in short supply in the last decade. Post smolts, carried by ocean currents or storms to areas of sea where food is in short supply, are often under-weight and vulnerable to predation or starvation. In better times those fish would have returned after one sea winter as healthy grilse. The few that do return now are often emaciated ‘thin grilse’ with poor reproductive capability, although there are signs that this may be starting to change as a result of cyclical, geophysical changes. Salmon spending more than one winter at sea tend to go further afield for their nutrition. Areas west of Iceland are generally more reliable for feeding salmon than the northeast Atlantic. While feeding at sea some predation and human exploitation takes place, but neither of which is likely to represent a ‘cliff edge’ of mortality for Atlantic salmon. Discovery of the West Greenland fishery in the 1960s has led to severe curtailing of that fishery. Credit for the long hard process of persuading the Greenlanders to reduce exploitation of wild Atlantic salmon from unknown rivers of origin should go to Orri Vigfusson, NASCO and science based conservation bodies such as ASF and AST – and of course to the Greenlanders who have responded to our requests to take action. By the time our multi-sea-winter (MSW) salmon return to our shores their migrations will have covered about 8000 kilometres. As they arrive in our coastal waters they run a gauntlet of obstructions and dangers from natural predators and human exploitation. Typically weighing 8lbs to 12lbs, these MSW salmon are an enticing prey target for whales, dolphins, porpoises and seals. Compared with other pelagic species the wild Atlantic salmon is a rare species in the open sea. It is only when salmon prepare to return to their home river that they start to coalesce into denser shoals for their journey along the coast. At this stage of its migration the adult salmon survivor is vulnerable to all forms of predation, especially coastal netting. In a dry summer, when river flows are at a minimum and salmon are forced to wait in estuaries, research has shown that more than 50% can die from a range of causes, including predation by human, pinniped and cetacean species. All these natural predators are protected by law, and there is every reason to think, certainly in the case of common seals, that there will soon be blanket protection, with no culling licences issued. A visit to the Moray Firth soon confirms the threat posed to salmon by pods of dolphins. Research shows that about 17% of the diet of some Atlantic grey seals consists of wild Atlantic salmon, and in some areas far less. But with about 200,000 grey seals and 20,000 common seals in UK waters, mostly in Scotland, there is undoubtedly a serious problem for salmon survival, the full extent of which has yet to be properly measured. This somewhat amateur look at predation of wild Atlantic salmon and sea trout is an effort at putting in context the understandable frustration of anglers, such as myself (! ), who often make demands for draconian measures to deal with predators. Most often the frustrated angler takes it out of what he sees before his or her eyes. Usually that means sawbills or seals. The damage being done out of sight, below the water’s surface, is ignored despite increasing evidence (e.g. on Canada’s Mirimachi) that predating fish species such as bass are decimating outgoing smolt migrations. I want to emphasise that these thoughts are those of someone who tries to manage a stretch of an east coast Scottish river in the context of its indigenous flora and wildlife. Getting the balance right between the economic driver species – salmon and sea trout – and the various habitats required by other species is a challenge, to say the least! Posted in Uncategorized | Comments Off on THINKING ABOUT PREDATION: HOW DO WE DECIDE THE PRIORITIES?